Fans of From Software’s Dark Souls franchise had the pleasure of playing one of gaming’s most consistently excellent series in recent memory. 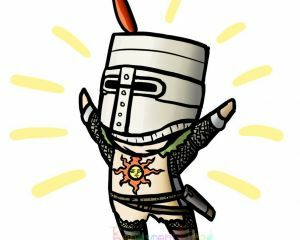 Yes, I’m a fan: I’ve poured a cumulative 250+ hours into the Dark Souls trilogy—and I know that some will still judge me as a casual for having “only” spent that much time on the games. It should come as no surprise, then, that I crawled back out from under a rock to blog about the newest From Software game. But I must say, my feelings about this new entry into the From Software canon are mixed. After years spent on western fantasy plots—and one weird diversion to disease-ridden Victorian England—From Software have elected to direct their talents towards a Japanese-inspired fantasy story with Sekiro: Shadows Die Twice. You play as The Wolf—no, not the one from Pulp Fiction—an elite shiobi who obtains the ability to come back to life from his young master, the Divine Heir. The plot of Sekiro is as transparent as any other FromSoftware title; that is to say, not transparent in any way whatsoever. The player’s objective is clearer than usual—a few introductory cutscenes make it clear that our objective is to rescue the Wolf’s young charge—but the obstacles the player faces on the way to that objective are often unrelated to that objective. Rumor has it that series mastermind Miyazaki writes his stories by planning out the entire plot of and then removing chunks of it to keep the player guessing, and that sensibility is on display with Sekiro as well. I remember thinking a few hours into the game, “I don’t know why an enormous white snake is pursuing me through this valley, but I have to admit it’s pretty sweet.” The complete history of Sekiro is something that the player won’t fully understand without paying attention to background details and item descriptions (or watching a video put together by someone else who did). Gameplay-wise, Sekiro is different enough from the Souls games that I think it ought to be considered something entirely new. Whereas Dark Souls and Bloodborne focused on the player’s offensive capabilities, Sekiro is built around parrying, a less-appreciated tactic in the Souls series. Combat in Sekiro is much more viscerally satisfying than past FromSoft games, as a successful kill requires precise timing to outmaneuver your opponent. Boss fights are all the more satisfying, as they require the player to truly master their opponent’s moveset to succeed (more on that in a bit). The switch from an attack focus to a defense focus has a huge impact on the flow of gameplay from previous games, and the change is enough to make the core Souls mechanics underneath feel fresh again. The addition of a stealth component also makes the core gameplay loop feel slower and more calculated, though I’m not entirely certain that that’s a good thing. For a game that leans so heavily on the precision of its core combat mechanics, the stealth in Sekiro feels very imprecise. Anyone who’s played a Souls game is familiar with the tactic of luring out enemies one at a time rather than facing them all at once, and the same strategy is viable in Sekiro. There are segments of the game where the player is expected to stealthily take down all of the enemies in an area, but these segments suffer from the same issue that plagues most games with stealth mechanics: once you’ve been spotted by an enemy you were hoping to save for later, the whole area becomes alerted to your location. This leaves the the player the choice of either hopelessly fighting against too many foes at once, or starting the segment over again. For the most part, stealth is a way of avoiding combat; but if combat is the main challenge and fun of the game, why incentivize players to avoid combat with a clumsy stealth mechanic? Ultimately, the stealth elements feel like a misstep borne out of a desire to mix up the core Souls gameplay. The game’s eponymous mechanic of resurrecting from the dead also feels suspiciously like innovation for its own sake, but it certainly doesn’t hurt the game. The Souls series explained the player’s ability to respawn with the Undead Curse plot device, and the player’s ability to rise up and get back into battle after dying is likewise explained in Sekiro as being the gift of the royal heir’s blood. As far as gameplay is concerned, the resurrection acts as an extra bit of health for the player to work with; however, abuse of this resurrecting power eventually takes a toll on friendly NPCs. More than anything, the mechanic is another way for masochistic Souls fans to get aggravated: it’s easy to be fooled into thinking that you have enough health to beeline for the boss and finish him off, but you’re often going to be mistaken. As with the Souls series, the boss fights are the greatest challenge Sekiro has to offer. The Souls games often provided ways to “cheese” boss fights with certain items or weapons, and the same can be said of Sekiro to a certain extent. Most mini-bosses can be stealthily approached to take out one of their health bars, and a number of enemy types can be incapacitated easily with the use of items or upgrades. On the other hand, most boss “cheese” maneuvers make the bosses easier, not easy. The emphasis on blocking rather than attacking means that a player must become familiar with a boss’s very precise attack patterns to emerge victorious. I suspect this is what is meant by those who say that Sekiro is harder than the Souls games; the “easy” way of defeating a boss usually still requires a decent amount of skill from the player. Compare this with the Souls series, where some bosses can be dispatched in a few hits with the appropriate elemental weapon. The challenge in Sekiro stems much more from mastery of its mechanics, as opposed to strategic use of stats and items in the Souls games. In closing, it must be said: Sekiro isn’t Dark Souls, and that’s okay. It’s no surprise that the From Software team wanted to try something new after sticking to the same main formula for four (arguably five) straight games. And Sekiro reflects that desire very well: the game feels fresh while still remaining faithful to the core design that made the Souls games such a success. But the trouble with innovation is that things don’t always work the first time out, and there are elements of Sekiro that stumble. Overall, the game is a solid product from a team that has proven time and again that they can be trusted to provide a quality experience. But Souls series faithful might be disappointed that the game has moved away from a few core elements of that franchise, and find that this new experiment is a little too different for their liking. Overall, I give Sekiro: Shadows Die Twice an 8/10. I'm a simple man. I like games and I like writing about them.